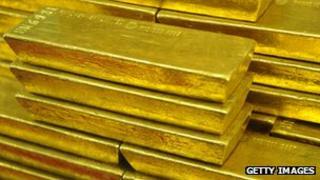 Italian police have seized assets worth at least $200m (£125m) from a network of suspected gold smugglers. Officers raided more than 250 addresses across the country, including a villa allegedly used to stash gold and money. The gang is suspected of smuggling the ingots into Switzerland after buying them on Italy's black market with laundered money. The booming cash-for-gold sector has become an issue due to poor regulation and suspected mafia involvement. The investigation involves 118 suspects, the AFP news agency reports. The criminal network is accused of money-laundering, recycling cash and stolen jewels through cash-for-gold shops, as well as churning out ingots in foundries. Police said the villa confiscated near the city of Arezzo - a major centre for gold in Italy - was a safe house where the gang hid gold bars and laundered money. "The money came illegally into Italy from Switzerland, and was used to buy fraudulently obtained gold and silver, then sent back to Switzerland in the form of ingots," police officer Alessandro Langella said. Five hundred bank accounts have also been blocked as part of the large-scale police operation, BBC Rome correspondent Alan Johnston. The authorities said they had seized $207m worth of profit made by the gang this year through shipping more than 33,000lb (15,000kg) of gold and silver across the border. Police were also targeting high-street shops set up to buy gold from the public, our correspondent says. As Italy's economic troubles have deepened, an increasing number of people are turning to these stores in order to sell off their jewellery. But criminal organisations are alleged to have used the cash-for-gold businesses for money laundering and tax evasion, and there are concerns about the extent of mafia involvement. Experts believe the number of cash-for-gold stores to have quadrupled in the last two years. Of the estimated 28,000 shops, only a minority have registered with the Bank of Italy, government official Gianni Mancuso said. In August, police announced a 78% jump in the amount of gold, silver and cash they prevented from leaving the country illegally in the first half of this year.